In summer 2009, I started working at the Bio-Energy Center, a biofuels testing and research laboratory at Montana State University Northern. I was responsible for the Center's branding, advertising, marketing, publishing, website development and maintenance, and whatever else they needed on a day to day basis. Prior to hiring me, the Bio-Energy Center had no designer, and it showed; the Center's website was a busy, table-based design with image-based links, that was difficult to maintain or modify. Publicity materials were inconsistent, and usually printed out on the office laser jet. The logo was complex and messy, full of gradients, illegible at small sizes, and impossible to affordably reproduce for clothing or merchandise. Even the name was ungainly; "The Montana State University Northern Bio-Energy Innovation and Testing Center". Try putting that on a bumper sticker! The first job was to redesign the logo, something that would be distinct at any resolution, could be easily and cheaply screen printed and embroidered, and could be better incorporated into a new website design. I also pushed to get the Center's name shortened, not an easy task since it was originally decided by committee; fortunately, by then they had dealt with it long enough to realize it was too long. I went through about two dozen logo iterations before settling on a design that made everyone happy. Simpler, easy to use at any resolution, and easy to reproduce in any medium, even in a single color. The Center was finally able to order merchandise at a reasonable price; pens, water bottles, clothing, the works. My favorite merch items were the stainless steel water bottles, since they let me get a little more funky with the background design. 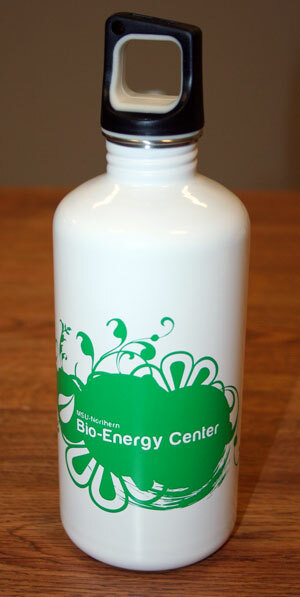 The next big job was to rebuild the Bio-Energy Center website. I coded it using HTML5, and designed it to look good at a wide range of screen resolutions.